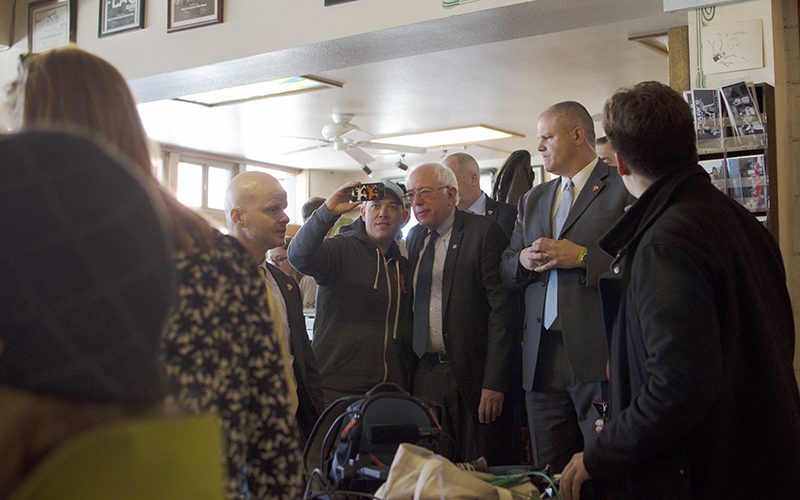 FLAGSTAFF — A cheer went up in Macy’s European Coffeehouse and Bakery in this small mountain city on Tuesday morning as Bernie Sanders walked in with an entourage of media outlets and Secret Service agents. The presidential hopeful has been upping his efforts in Arizona, which with its 75 delegates could take Sanders a step closer to catching Hillary Clinton in the primary race if he wins the state in Tuesday’s presidential preference election. In Coconino County, where registered Democrats outnumber Republicans and over a quarter of the population is Native American, Sanders has been courting the indigenous vote, speaking on Native issues at the Twin Arrows Navajo Casino Resort on Thursday and again at a rally in Flagstaff Monday night. On Tuesday, he walked the streets of the city, stopping to greet and take photos with excited fans. While Flagstaff residents say they’ve seen a majority of Native voters supporting Sanders, some, such as Oneida Iroquois Ku-Nu Powless, 51, are casting their primary vote elsewhere. Powless is a registered Republican whose biggest political focus is on education and a strong economy. As of Tuesday morning, he wasn’t sure who he would vote for in the primary but said he was leaning toward voting Democratic in the general election. There are others who are not registered as Democrat and thus won’t be voting in the primary, such as Phyllis Hogan, who is Choctaw and a founding member of the Arizona green party. She supports Sanders because of his recognition of the issues Native American communities face but said she remained registered with the green party to maintain support for her beliefs. She took a picture with Sanders when he stopped to greet passersby on a downtown Flagstaff street corner. In Coconino County, 27 percent of the population is Native American, in contrast with 5 percent for the state. As of January, the county had 26,000 voters registered Democrat and 18,000 registered Republicans. Powless, Hogan and others said they felt the majority of young Native Americans in the county — and the majority of the Flagstaff’s population as a whole — were Sanders supporters. William Rhodes, 36, shares that perspective. Rhodes works at Mountain Sports Flagstaff and watched Sanders walk down the street outside the shop window Tuesday afternoon. “I would have liked to have seen him in a town where they aren’t Bernie supporters,” Rhodes said, indicating that Sanders’ visit may have been more effective in a city where residents weren’t already planning on casting their votes for him. Sanders has held rallies and expressed outspoken support for Native American issues in Arizona, including his wife’s recent visit to Oak Flat just outside Superior, where a copper mine is planned atop Apache holy land. Yet some Native Americans living in Flagstaff, such as Powless, lean toward Clinton, who has also expressed support for indigenous peoples. Others, meanwhile, align with the Republican party, whose members have generally remained silent on indigenous issues. One member of the Jemez tribe who preferred to remain anonymous due to discomfort speaking publicly about political issues said were he registered to vote — he never has been — he would vote for Republican hopeful Donald Trump, as he was the only candidate who may build a border wall to stop illegal immigration. He remains unregistered, however, because he feels Native Americans are underrepresented in U.S. politics. Others such as Hogan, however, believe Sanders has the potential to bring representation of Native issues to the fore.